A normally dull star in Ursa Major, the Great Bear constellation, give off an incredible flare while scientists watched, increasing its brightness 15-fold in just three minutes, before returning to normal. Dubbed WX UMa, the stellar body belongs to a rare class of variable stars known as flare stars, which suddenly and unpredictably boost their brightness in a matter of moments. But the flares are fleeting; these stars revert to their dimmer state in tens of minutes, researchers say. WX UMa lies in a binary system in Ursa Major roughly 15.6 light years from Earth. It's outshined by a companion star that's 100 times brighter, except during the few times a year when WX UMa gives off luminous flares. Researchers say they have seen WX UMa get fired up before, but never as dramatically as during their observations at the Byurakan Observatory in Armenia between May and June 2012. 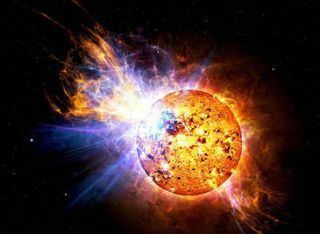 "We recorded a strong flare of the star WX UMa, which became almost 15 times brighter in a matter of 160 seconds," astrophysicist Vakhtang Tamazian, a professor at the University of Santiago de Compostela in Spain, told Spanish science news agency SINC. "Furthermore, during this period of less than three minutes the star underwent an abrupt change from spectral type M to B; in other words, it went from a temperature of 2,800 Kelvin (K) to six or seven times more than that." Such flares likely arise when instability within the plasma of the star causes turbulence in its magnetic field, Tamazian explained. "A magnetic reconnection then occurs, a conversion of energy from the magnetic field into kinetic energy, in order to recover the stability of the flow, much like what happens in an electric discharge," the researcher told SINC. Tamazian said this kinetic energy transforms into thermal energy in the upper layers of the atmosphere and the star's corona, driving up its temperature and brightness. Because flare stars are weak, scientists can observe only the ones that are relatively nearby, up to a distance of a few tens of light years. Researchers are particularly interested in flare stars in binary systems, Tamazian said, "because we can investigate whether there is any relation between the frequency of flares and the position of the pair of stars on their orbit, a question which remains open." The research was detailed in the journal Astrophysics.